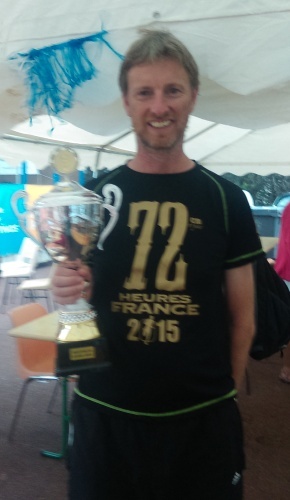 I don’t know where to start with writing my report on the 2015 edition of the Privas 72 hour race. The heat perhaps. 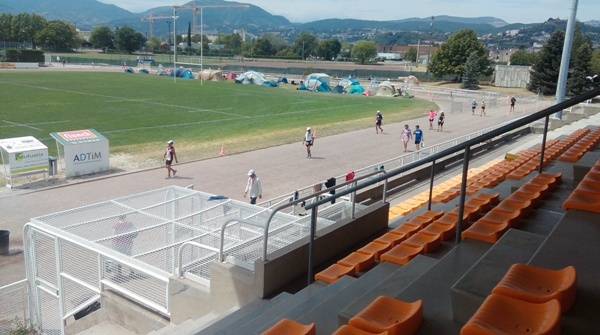 It was too hot to go to the beach so we decided to walk around a track for 72 hours instead! If you were on holiday in the heat we had during the race, you would spend as much time as you could in the water or in the shade. You would definitely avoid any physical activity. With daytime temperatures of up to 39 degrees and night time temperatures in the 20’s, this was definitely the hottest race I have ever completed in. 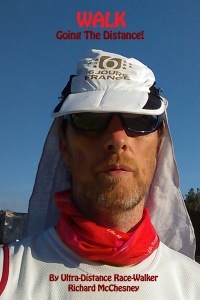 My initial goals of completing up to 250 miles (400km) during the three day race were unlikely to be met and it would be more a battle of survival than a race – especially during the heat of the day. 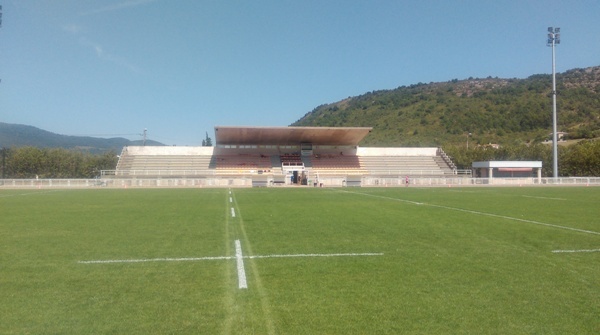 I left home at 4:30am on Tuesday (the day before the race) to travel to Privas in South, East France. Two buses, a tube ride, and then the Eurostar from Kings Cross St Pancras station through to Paris. And from there, 2 hours on a French high speed train to Valence TVG, 1 ½ hours on a bus to Privas township, and a ride in a van driven by a Frenchmen (Laurant) who didn’t speak any English but I was reasonably confident that he was the guy who had been sent to collect me from Privas and take me the few miles out of town to the track, and my home for the next four days. 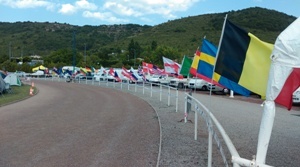 The flags of 22 countries that were represented in Privas. Also note the surface which we walked on – hard packed ash and stone chip. On arriving at the track I immediately discovered what I was up for. 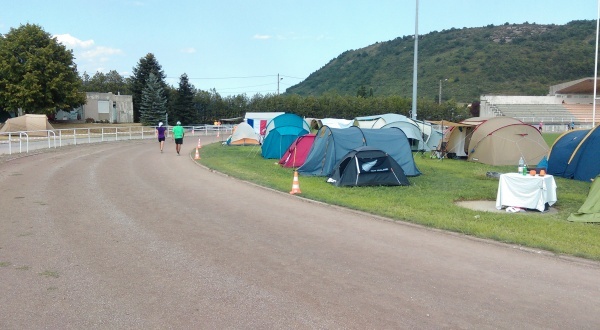 The six day racers were almost 50 hours into their race. 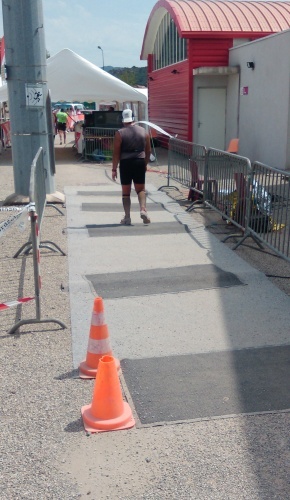 No one was running (there were 120 runners and 20 walkers entered) and there were very few people actually on the track – the track being a 1,025 meter circuit comprising mostly of a hardpacked ash and small stone chip surface with a few hundred meters of tarmac. 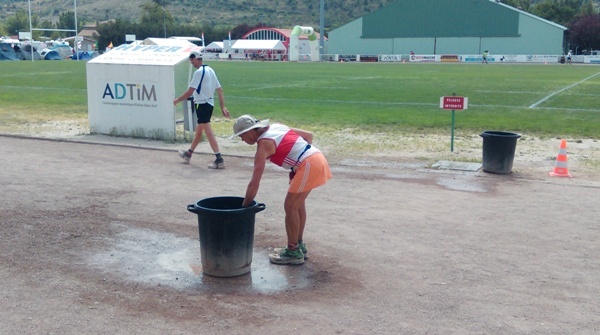 I met Jamie, Suzanne Beardsmore’s son, who informed me that Suzanne was out on the track but Kathy Crilley (the other English competitor in the six day walking race) was sleeping in the women’s changing rooms as it was too hot to sleep in the tents during the day. 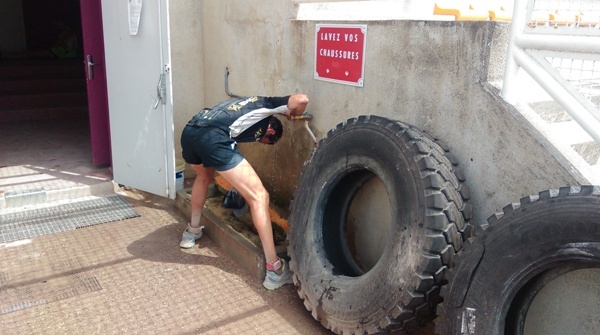 And Jim, Suzanne’s partner and the second member of our support crew, was also sheltering from the heat back at the hotel. Jim and Jamie had already set up my tent so I decided to take my bag down to the tent and start organising my food, clothes, etc. As soon as I opened the tent I realised what Jamie meant about “too hot in the tents” and decided to leave the organising until later on. After cheering on Suzanne for an hour or so, Jim, Jamie and I went to McDonalds for dinner. McDonalds is often a pre-race meal for me before ultra-distance events as all I am really focussed on is consuming as many calories as possible and also ensuring that I am not going to eat something that might cause stomach upset during the race. We watched a bit more of the six day race after dinner and I was fortunate enough to be offered the spare bed in Jim and Jamie’s hotel room where I got an excellent 11 hours sleep – perfect pre-race preparation. Race start wasn’t until 4pm so after a good sleep-in I went to the local supermarket to purchase some more food – a late breakfast, some food for lunch, and some more suppliers for the race – and headed down to the track. Early in the race. Walking strong. 4pm finally arrives and we are off. 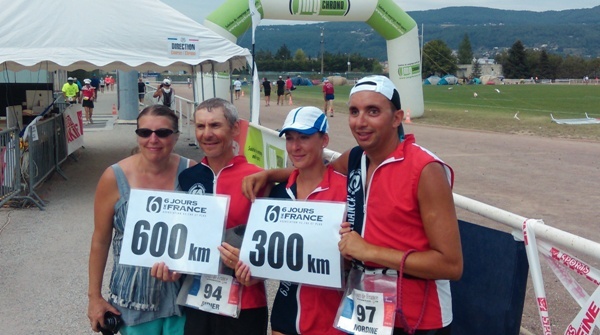 There are three competitive walkers in the field (Benedicte Salomez from France, whom I had raced at Roubaix last year and Chateau Thierry this year and beaten both times, and Xabier Salillas from Spain whom I hadn’t met before) as well as one other walker and 13 runners. A total field of just 17. 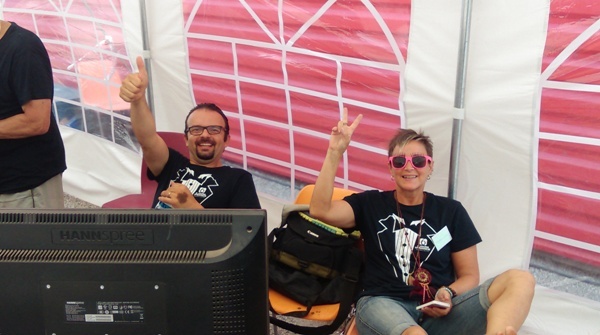 Benedicte, Xabier, and I shared the lead for the first few laps, circling the track in a little over 8 minutes per lap. 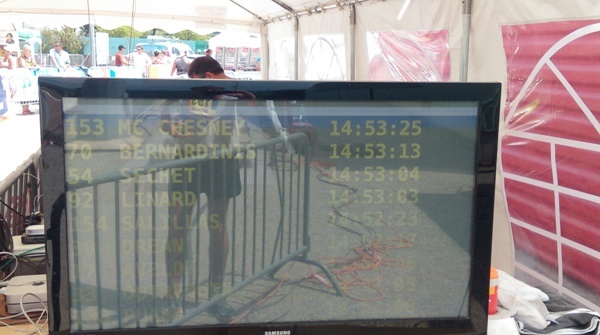 A little slower than I had planned for the early stages of the race but it was hot so I wasn’t going to push the pace. After a while I pulled away from the other two and starting lapping them both as the evening progressed. It was hot though, and even after midnight I was pouring cups of water over my head to try and keep cool. I went through 50km in a shade under 7 hours. I had been expecting a time of around 6 ½ hours but given the heat I wasn’t concerned about the pace, and as it turned out, this would be my fastest 50km of the race. I like to post updates on facebook during the long races as it gives me something to do other than just focus on walking lap after lap, and I remember posting the words “Something is wrong – going to stop for a sleep” or similar. What I can’t remember is whether that was before my first sleep or between my first and second sleeps. At around 2:30am, whilst leading the walkers and in third place overall, I suddenly felt absolutely terrible and couldn’t go on. I was approaching the end of the track where my tent was located and all I could think about was getting my sleeping bag out and lying down for a few minutes. So I did. I slept for an hour and then resumed the race. But I still didn’t feel well and whilst I thought at the time that I only did two laps, it appears that I walked for an hour before deciding to have another sleep. This time I was off the track for two hours but only slept for one. When I woke up the sun was rising behind the hills and I just couldn’t face the idea of getting out of my sleeping bag. So I lay in my sleeping bag beside the track watching the runners and walkers go by and pretending to be asleep. During the night I had been shivering, even in my sleeping bag with a long sleeved top on in 20+ degree temperatures, and I didn’t want to find out what would happen when I stood up and started walking. So I didn’t. I finally started walking again around 6:45am and, other than a few breaks for some shade, I trudged around the track the best I could for eight hours until the heat told me I needed to shelter for a while. 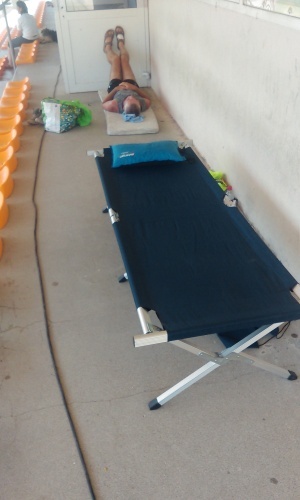 So an afternoon rest in the shade right up the top of the grandstand seemed like a good idea and I carried my camping stretcher up there, took my shoes and top off, and went to sleep in the shade for 1 ¾ hours. 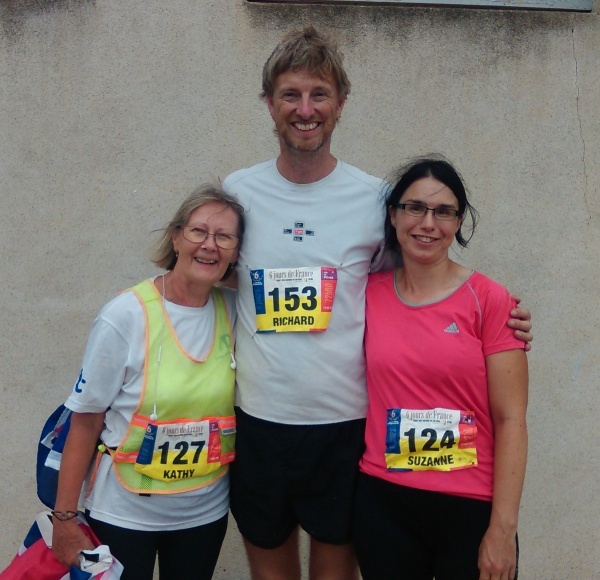 By the time I woke up and resumed the race I was third walker, 20+km behind Benedicte, and 11th overall in the field of 17. The race was not going to plan! I walked a few laps at 8:30/lap pace and felt good. It was still hot but I told myself that when the sun went down tonight I was going to start racing again. 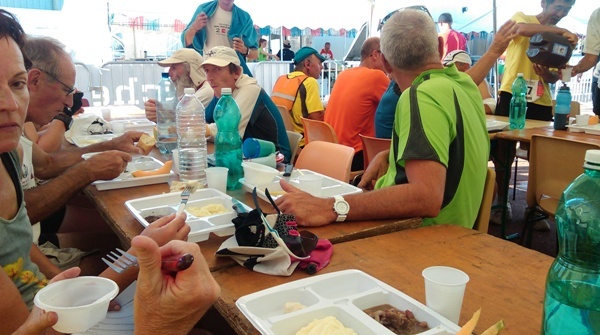 So after about an hour I took a short break for dinner – the race organisers supplied a sit-down breakfast and dinner each day which athletes could partake in if the desired – and then started my push through to my 48 hour goal/target – the NZ 48 hour record. In the first 24 hours I had covered just 110km. 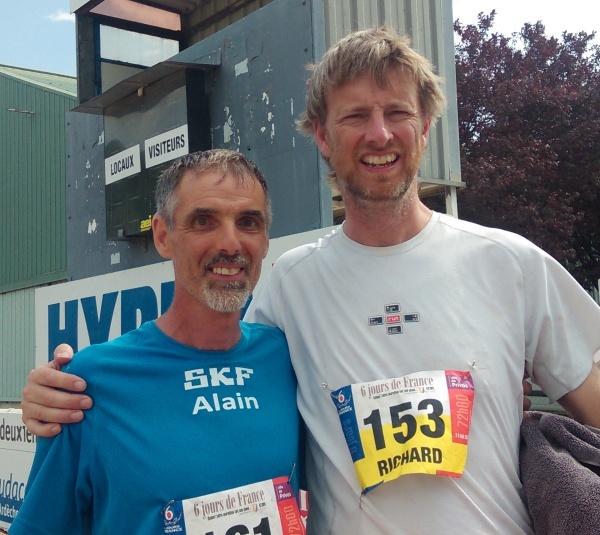 The existing NZ 48 hour record (the easiest record in the NZ ultra-distance record book) was just 230.25km. 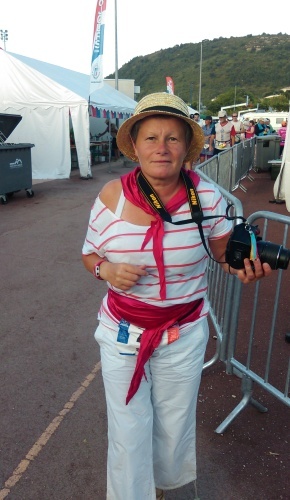 I had walked 233km in 43 hours in the Grand Union Canal Race back in May but that wasn’t a walking race with walking judges, so it didn’t count. My intention before the race was to cover 280km+ in the first 48 hours of the race and then hopefully get through to 400km+ by the finish. But the high temperatures had put paid to that idea before the race even started. 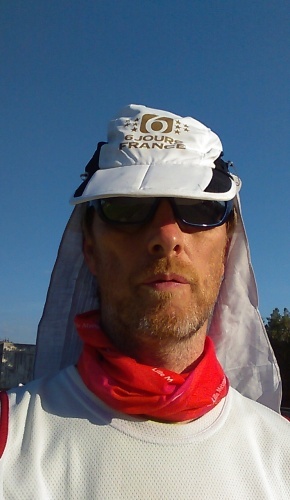 120km in the second 24 hour period was still possible though and when I resumed walking after dinner I had 20 hours in which to cover about 110km – I can’t remember the exact numbers unfortunately but I knew it was still possible. 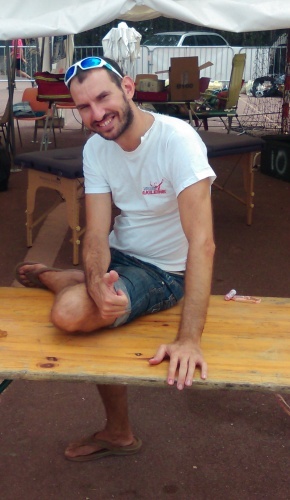 But at about 10pm a blister burst on my left heel and I was slowed to a limp through to the end of the lap and a visit to the medical tent. 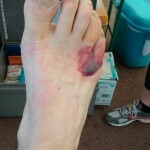 I thought it would be a relatively short stop to get the heel taped up, but when the doctor saw the state of my toes he insisted on draining and taping the four blisters on the front of my foot as well as dealing with my heel, and I ended up spending exactly an hour in the medical tent. I refused to show him my right foot though as I feared that might be just as bad. The track surface had badly cut up and blistered both feet but I had to get moving and I promised to bring my right foot back to see him after 4pm tomorrow. I left the medical tent with about 16 hours to go (until 48 hours would be up) and from memory, about 90km to cover to get the record. And pretty much for the next 16 hours all I did was try and remember my time at the end of each lap so that I could calculate how long the current lap took me when I saw the clock again. I had to complete each lap in under 11 minutes average time, including any breaks I might need during the next 16 hours. Sounds easy, but add the heat into the equation and I promise you, it was definitely not easy. Sometimes I would get to the end of the lap and forget what the time was at the start of the lap, so I would have to hope it was a good time and get on with the next lap. About once an hour I would take a few seconds to stop and read the scoreboard TV screen which was off to one side of the track and couldn’t be viewed without stopping. It showed the position of each athlete and their total distance, but it wasn’t always 100% up to date. I remember watching it once when my distance suddenly increased by two laps while I was watching the scoreboard. So whilst it showed me gradually moving up the field, I could never be 100% sure how many laps I had done or how many I had to go. I stopped briefly upon passing both 100 miles (35 ½ hours) and 200km (42 hours I think) but other than that it was 16 hours of relentless forward momentum, watching the clock and trying to calculate my lap times and what pace I needed to maintain to get that record. With an hour to go I was getting concerned that I wouldn’t make it. I tried messaging my wife figuring that she could follow the results online and let me know whether I was going to make it, but she wasn’t home. I stopped at the scoreboard again and calculated that I should complete the lap that would see me completing 231km with about 15 minutes to spare. This would give me time to do one more lap before the 48 hours was up so that I could at least raise the record distance to 232km. I don’t know why that seemed better to me than 231km, but it did. 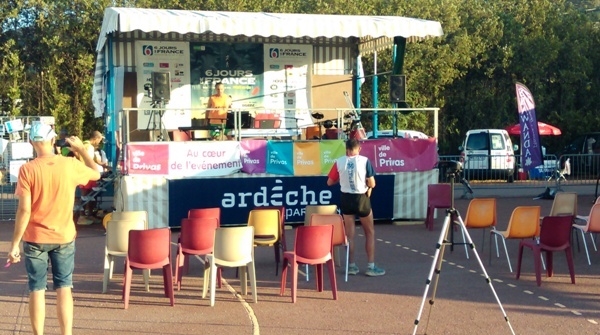 The race announcer was aware that I was close to breaking the NZ record and made a few announcements to the supporters and other athletes (if any of them were listening) in French. Just a little bit more pressure. I had to make sure I did it now. And then, at roughly 3:53pm, 47 hours and 53 minutes after starting, I completed the lap that I thought would take me through to 232km and announced that that was far enough, I wasn’t going to add a part-lap to the record distance. 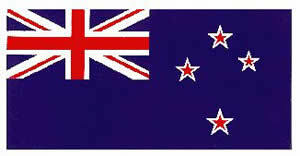 I had beaten the NZ record!! And it turned out I had walked one lap further than I thought I had. 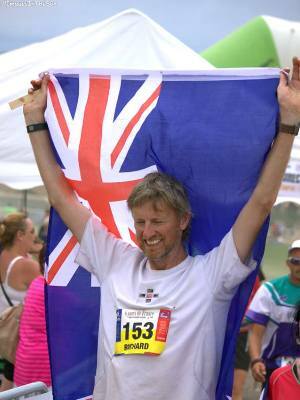 The new NZ 48 hour race-walking record was now 233.075km! I had beaten the old record by 2.7km. But it had taken a lot out of me, both physically and mentally. There was no way I could continue immediately, even if I wanted to. It had been almost 24 hours since I woke from my last sleep and I intended to have a bit of R&R before continuing. I headed to the medical tent first but when they saw my feet and I explained my intentions to take a bit of a break, they asked me to have a shower first so as to reduce the risk of infection when they tended to the blisters – and to enable them to see the blisters as my feet were black from the dust and dirt on the track. 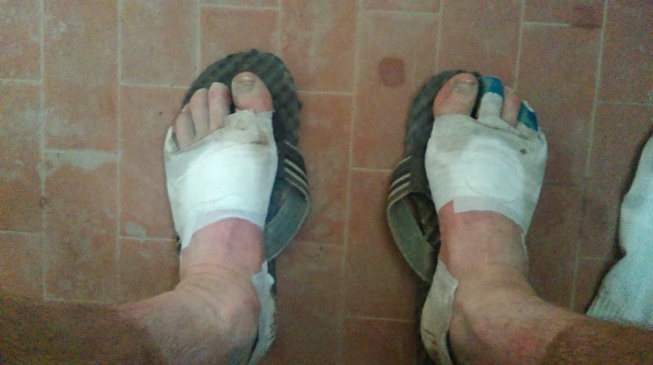 So I walked back to my tent and picked up my towel and a change of clothes and then spent a good 30 minutes or more carefully removing the tape that the medical staff had so expertly applied to my left foot the previous night. After a shower I spent an hour or more in the medical tent getting numerous blisters on the top, bottom, and sides of both feet drained and taped so that I would be able to continue walking. I had dinner and then a 1 ½ hour sleep. All up, I had 7 ¼ hours R&R. Talk about luxury. 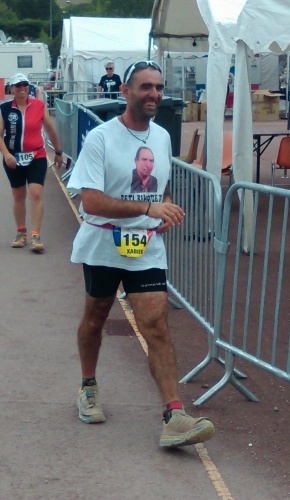 My wife commented after the race that I went to France for a holiday and did a bit of walking while I was there, and when I look at the amount of time I had off the track I can see why she thinks that. 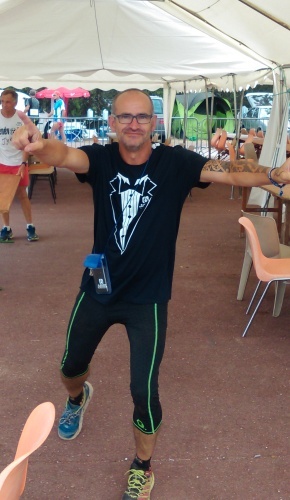 When I stopped at 48 hours I was back in the lead in the walking section, 26km ahead of Benedicte and 32km ahead of Xabier, and I was third overall, just 1km behind the second placed runner. But 7 hours later I had once again slipped down the field in both categories and was 7th overall. I think Benedicte was 5th overall but can’t remember exactly. It was close to midnight when I decided to start walking again. 16 hours to go until the race finish. Maybe I could complete 87km to get to 320km (200 miles). That would be a good result given the conditions. If I couldn’t get to 320km then 300km should be easily achievable. I walked through the night, and didn’t stop for breakfast as I wanted to get as far as I could before the day started to heat up. I passed Benedicte again during the night. I think she took a few breaks and I remember her telling me at once stage that she was suffering. 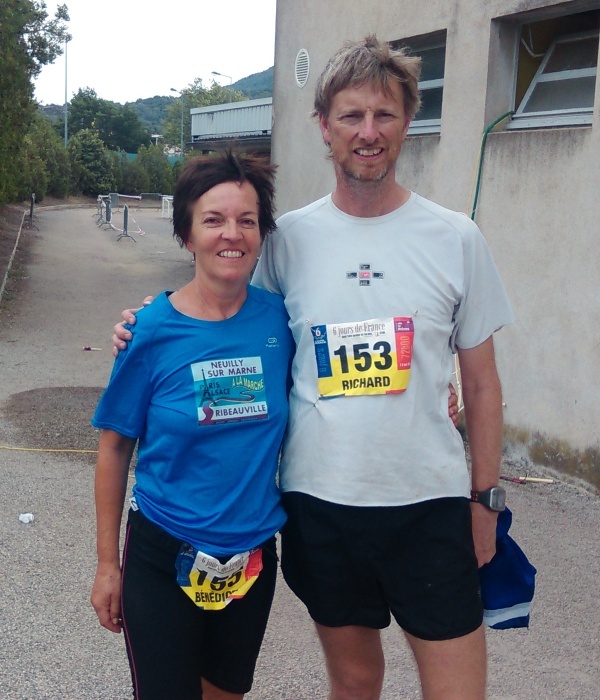 But as the day started to warm up I started to struggle again and Benedicte slowly unlapped herself to the stage where we were both on the same lap – a lap that took me 24 minutes to complete!! I was gone. I had given the race everything mentally and, I thought, physically, and I had no more to give. This was the hardest event I had ever competed in. I had given up on the 320km target long ago and now it looked like I wouldn’t make 300km either. I decided that was it. 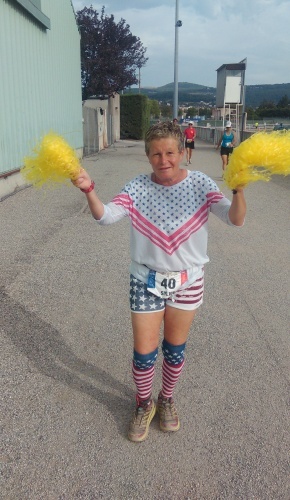 I had completed 67 hours of a 72 hour race but I couldn’t do any more. 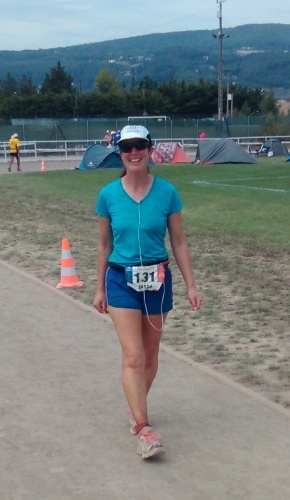 I had done 280km – 47km further than I had ever walked before. 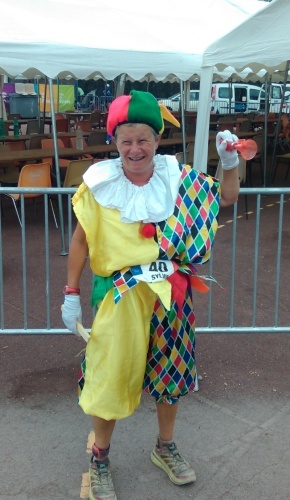 Suzanne was at the food tent when I completed the lap and told her of my plan – which was to watch the rest of the race from the shade in the grandstand. I picked up some food and an empty water bottle and Suzanne ensured that I made it around the half lap to the grandstand safely. I used the cold water tap at the grandstand to fill my bottle and then lay down on one of the grandstand concrete steps to rest. After a while I had a sleep – only 45 minutes because I wasn’t really that tired, I was just totally stuffed (to put it politely). After about four hours of resting I decided to take some photos of the athletes and slowly walked around the track where I found both Kathy and Suzanne. 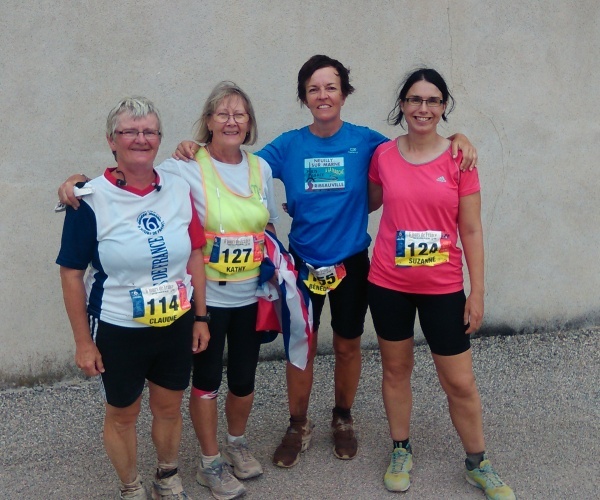 There was now only 30 minutes until the finish so we decided to walk another couple laps and just enjoy the last stages of what had been a difficult few days for us all – Suzanne had been off the track for two days due to illness and both Kathy and I had struggled with the heat. At 72 hours for me, and 144 hours for Suzanne and Kathy, the final gun sounded and we all stopped and put our small numbered piece of wood, which we had been given a lap earlier, on the ground so that actual distances could be measured. 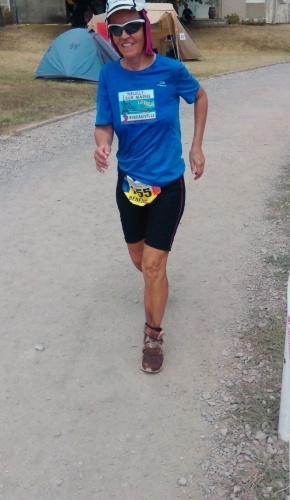 In the 72 hour race I finished second walker, 18km behind Benedicte, and 7th overall. 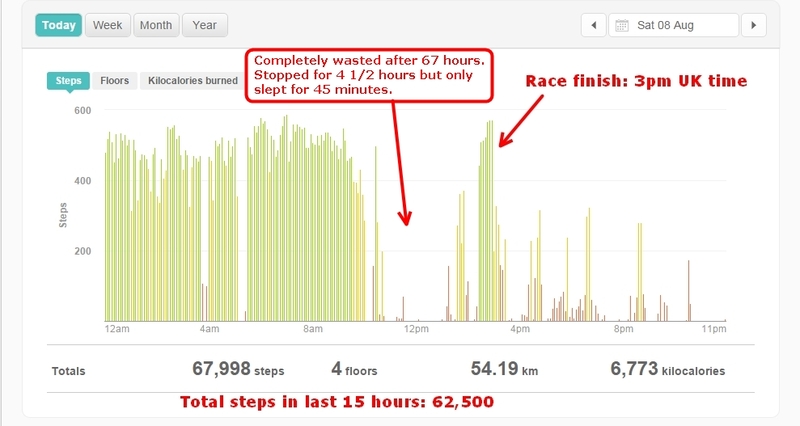 I wore my Fitbit during the race and it is thanks to this that I know so much about how much rest I had. 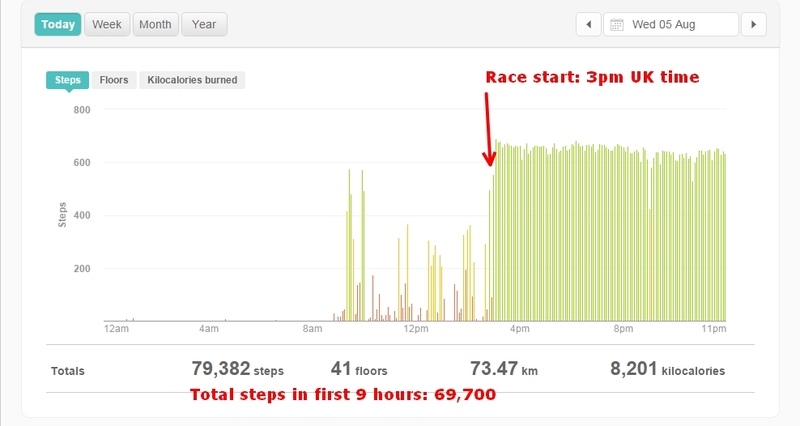 My original reason for wearing the Fitbit was that it would be interesting to know how many steps I covered in a 72 hour period (350,600) and I would also be able to see whether my cadence (the number of steps per minute) changed much during the race. Also, Fitbit measures how much sleep you have – which was a total of six hours in five separate sleeps ranging from 45 minutes to ¾ hours in length. 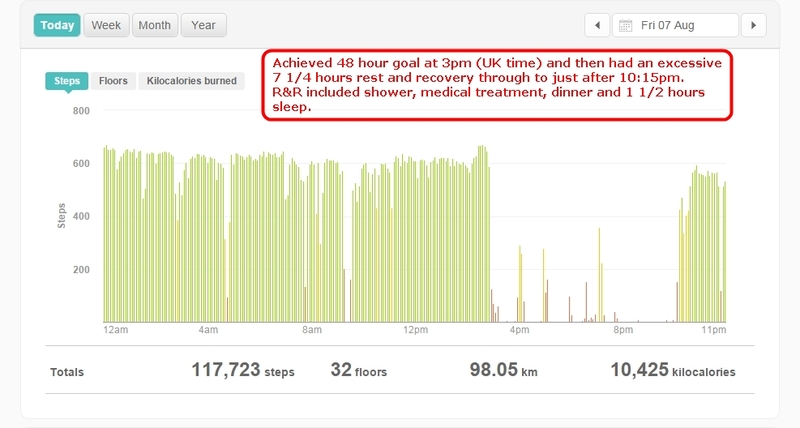 My average cadence during training in around 700 to 750 steps every five minutes – or 140 to 150 steps per minute. When I am doing speedwork that will increase to around 180 steps per minute, but most of my training consists of walks of between 10 and 30 miles in distance at 140 to 150 cadence. It was interesting to see that other than the last day and the section during the heat of the day on Thursday, my cadence was consistently around 600 to 650 steps every five minutes (120-130 steps per minute). 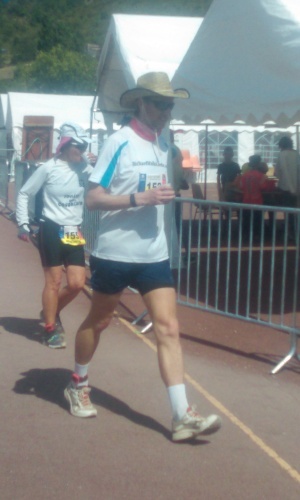 Once I resumed walking at around 55 hours in to the race after a 7 hour break I never actually got my cadence back up to the levels it had been earlier in the race. Was this due to mental or physical fatigue, or both? Or was it due to me taking too long a break and not being able to get back in to it. I’m not sure. 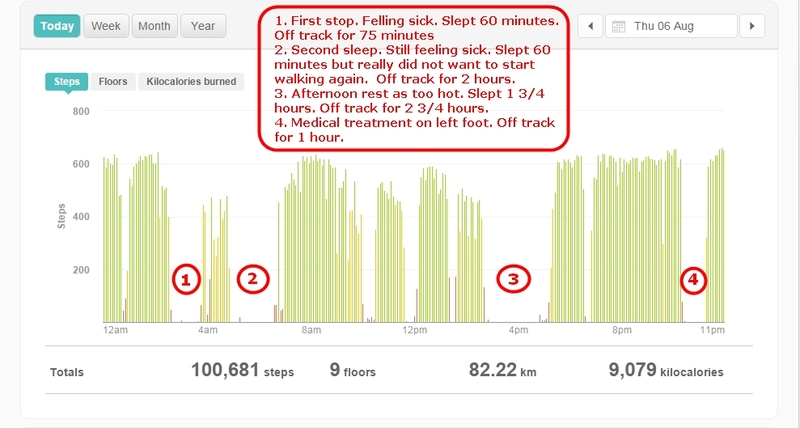 The Fitbit graphical analysis below also shows how much rest I had. It tells me that out of 72 hours I had six breaks of an hour or more and that those six breaks add up to over 19 hours. Add in the smaller breaks and I only barely managed to spend 50 hours actually walking! This was my first multi-day race. 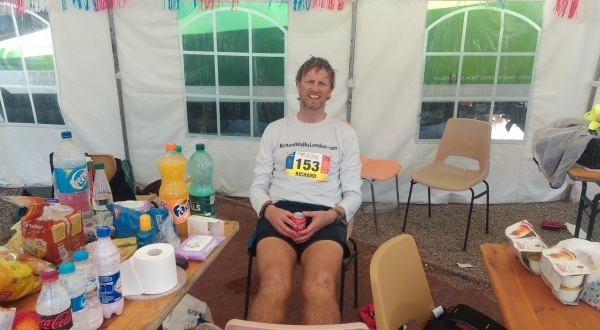 I had done the Grand Union Canal Race in 43 hours, but that was without sleep and didn’t quite take up two full days. This race took three complete days. 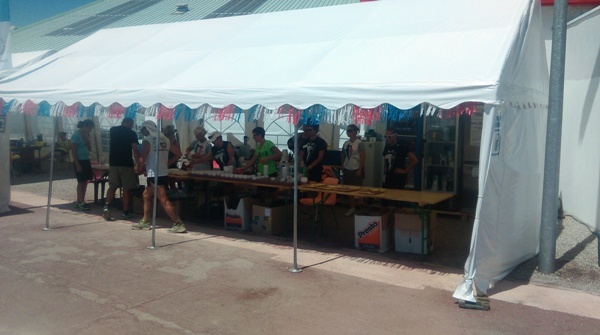 Some of the European athletes were extremely well organised. 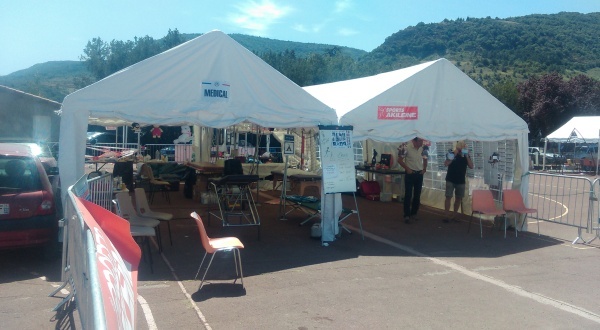 I have done two other ultra-distance races in France and you often see microwave ovens, fridges, etc, in some of the athlete’s tents. 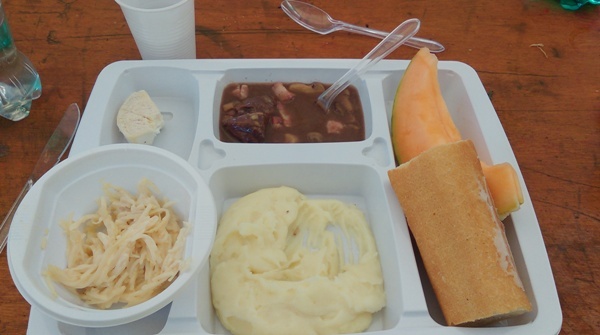 And if not, they often have all there supplies organised into different containers – i.e. fruit, biscuits, sports nutrition, etc, separated from first aid supplies, spare socks, sun block, etc. Something I can definitely improve on and especially important if self-supported as you want to be able to quickly access what you need when you need it. A bigger walk-in sized tent would also have been much better than having to get on my hands and knees when looking for what I needed from the tent. Don’t get me wrong, Jim and Jamie provided great support, but we didn’t have a proactive feeding plan and as a result I had heaps of food left over at the end which I had completely forgotten about during the race. 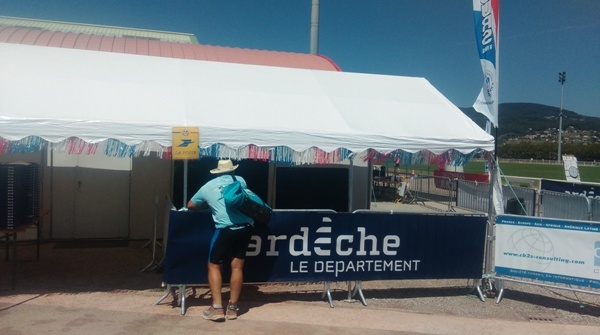 I had eaten a lot at the official food tent, but I had purchased plenty of food for the race which I didn’t touch – including pot noodles (500 calories per cup) and jelly (100 calories per cup) – and I also suspect that I didn’t eat enough calories on a regular enough basis. I often went several laps without food. At a minimum, next time I will set my watch alarm to remind me to eat regularly, but better still, ensure that my support team put some food into my hands as I go past them every lap (or two at most) without me needing to ask or think about it. When I have been walking for x hours I am not going to be thinking straight, and therefore may make bad decisions. The decision to have a 7+ hour break after completing 48 hours was wrong. The decision to stop after 67 hours was wrong. I probably made other wrong decisions too. 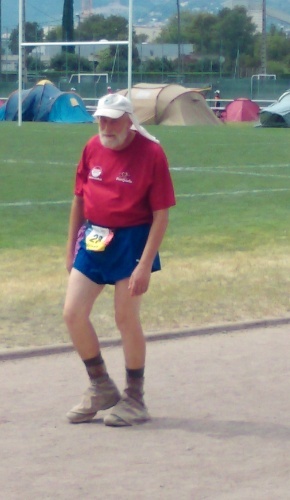 In my next multi-day race I need someone to make decisions like this for me. Someone to tell me when to sleep, when to eat, etc. I should be walking only and leave everything else to someone else. What I need is a “handler” – someone who does everything for me other than the actual walking. 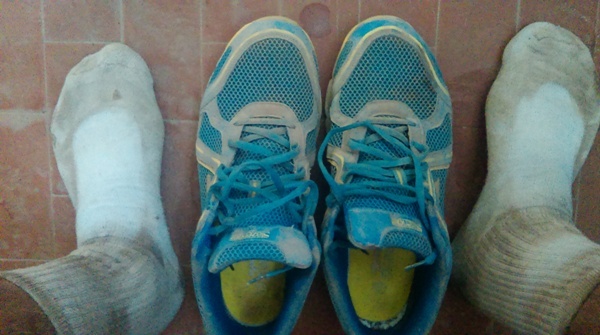 I took 3 pairs of shoes to Privas and wore each pair at different stages of the race – the first time I have changed shoes during a race. 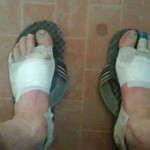 One of the pairs was an extra size bigger than my normal shoes to accommodate my feet if the swelled – which they did. But what I didn’t expect was the blisters. 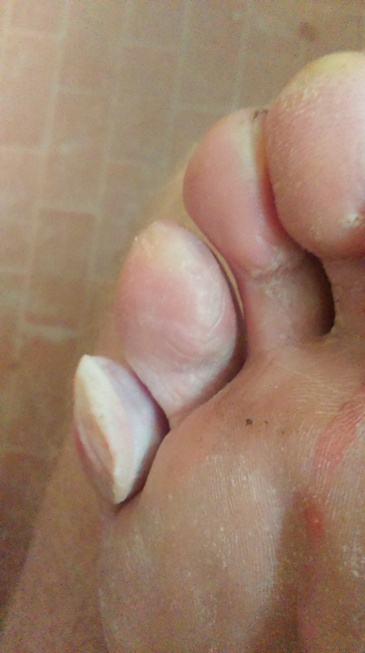 Both feet blistered badly around the area of the little toe (see pictures above) and on talking to some more experienced athletes after the race several suggested that I should have cut out the side of my shoe to make more room for my toes. This was an option I was aware of but didn’t think to try during the race. The medical experts did an excellent job with taping my feet. I used 2Toms Anti-Blister powder which I applied to my feet several times but in a multi-day race I think that taping is probably a better option. This is the third time that I have allowed negative thinking to get to me, and the third time that I have failed as a result. In Roubaix last year I was targeting 200km in 28 hours and when I realised that that goal was unlikely with about three hours to go, I was suddenly so tired that I needed a sleep before I could continue – and I finished with 186km losing four places in the last four hours. And then in the Thames Path 100 in May, at around 83 miles I realised that I would be unlikely to finish within 24 hours. I was with Louise Ayling at the time and she had the opposite, positive, view. Her finishing time ended up being an hour faster than mine! And this time, I think it was when I, probably mistakenly, realised that I wouldn’t make 300km that I gave up at 67 hours. Had I continued rather than taking a 4 ½ hour break, who knows what might have happened. Most of my training is at an average speed of about 5 miles (8km) per hour with occasional faster walks or faster segments within my training walks. But even in a 24 hour race I don’t walk that fast. So should I be training at a slow pace? I don’t know. But I do think that I need to do more 24 hour races as training for the longer, multi-day, races so that I can get my body used to sleep deprivation and walking at a slower pace when already exhausted. Perhaps I need to do less everyday training and more ultra-distance racing – with some races simply being training for other races. I had a goal to break the NZ 48 hour record as an interim goal but in reality that was probably more important to me than the goal for the whole race. 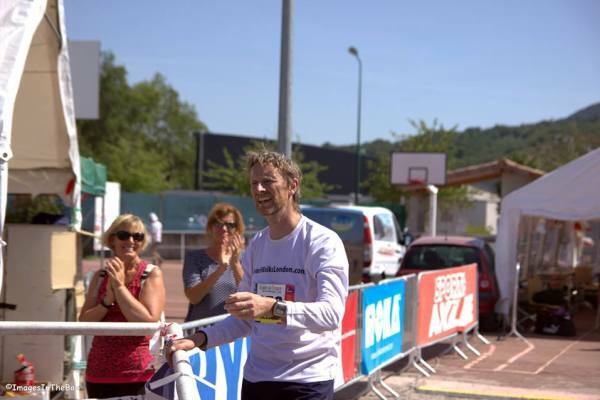 And therefore, mentally, once I reached that 48 hour goal my race was pretty much over and it was very difficult to keep myself going through to the finish – as we saw. I don’t mean to sound negative with the above list but at the end of the day the only failure is the failure to learn from your experiences and I think I have learnt some lessons that will help me greatly in my future races. After dinner entertainment – Karaoke. Richard Bergamini put more effort into his singing each night than he did his running! Me – after only 17 hours. 55 hours to go! 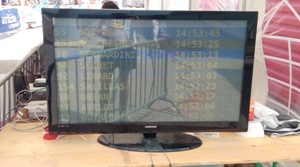 The TV screen showing our name and the time we crossed the timing mats. I was constantly doing maths to work out my lap times. These feet carried me 283km! 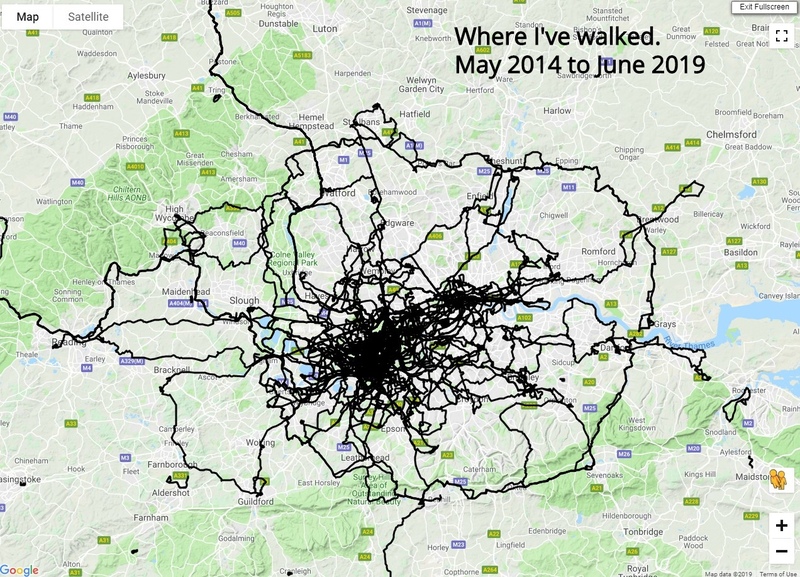 Fastest person to circumnavigate London's M25 motorway on foot! WALK – Going The Distance! 2015 was a huge year for me. 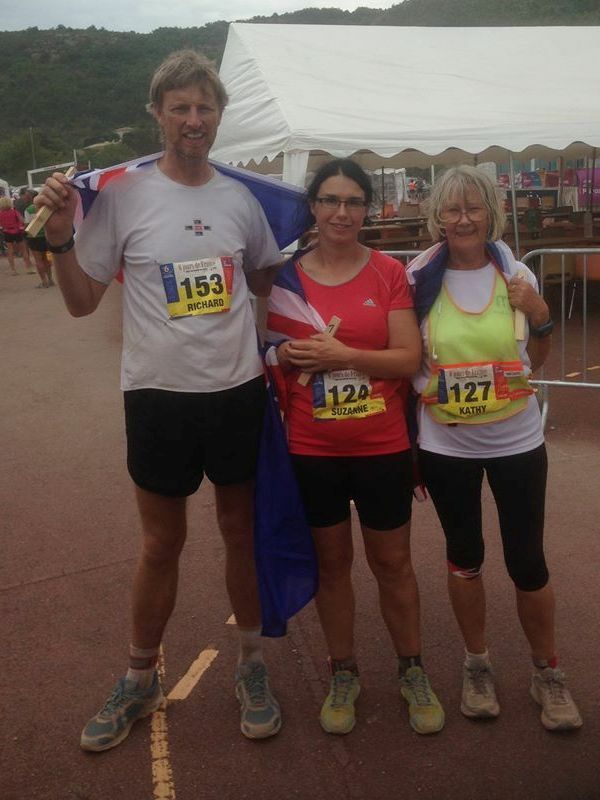 My goal was to beat 4 national records ranging from 100 miles upwards and complete my first multi-day race-walking event – the 72 hour race in Privas. I’ve written about my year and published a kindle ebook and paperback. These are available on Amazon for just £1.99/$2.99 for the ebook and not a lot more for the paperback.